Sine Mora EX was originally released on the Vita, 360, Windows and PS3 several years ago. The game was well reviewed and its success was followed up with ports on Android and iOS. Recently, Sine Mora EX was given a high def treatment and released on modern systems. Join The Gamers Lounge as we play this side scrolling shmup and realize everyone was right this game is fantastic. One of the most striking aspects of the game is the plot which is intertwined with two different stories. Both of the characters are after revenge for different reasons. The storyline takes some dark turns and can be hard to follow. There are some very mature themes blended with the the bleak tones of war. The plot may be a twisted mess, but the game itself has some nice features making more accessible to every sort of gamer. One of the most interesting elements is players do not have lives, instead the biggest enemy is the clock. Players must keep killing enemies so the timer builds up. Once it hits zero, players are doomed. If the ship takes damage, players will lose time and their primary weapon power ups. Each character has a unique secondary weapon and the ability to slow time. Both of these come in handy in heated battles. The gameplay is great and within this each stage is a visual masterpiece. There is plenty going on in the background. Gamers will be flying over breathtaking oceans with lush islands. The next stage may feature diving deep under the water only to surface to a war torn steampunk city. The game has a lot to offer in the way of visuals effects. There are massive explosions peppering the screen and large chunks of hazardous debris wipe by. All of this helps contribute to the fantastic design of Sine Mora EX. Sine Mora EX has some epic boss fights. Players are going to face mechanical spiders, giant airships, and stage consuming submarines. These boss fights are large, as the enemies control most of the screen and have plenty of tricks up their sleeves. The action never slows down. Players are going to have to learn how to slip through the cracks of enemy fire while delivering the killing blow. In this version on Sine Mora EX there are a few added bonuses for players. There is a nice couch co-op mode, one player flies the ship and the other one mans the guns. There is also an arcade mode, boss training, and a score attack mode to go with the story. 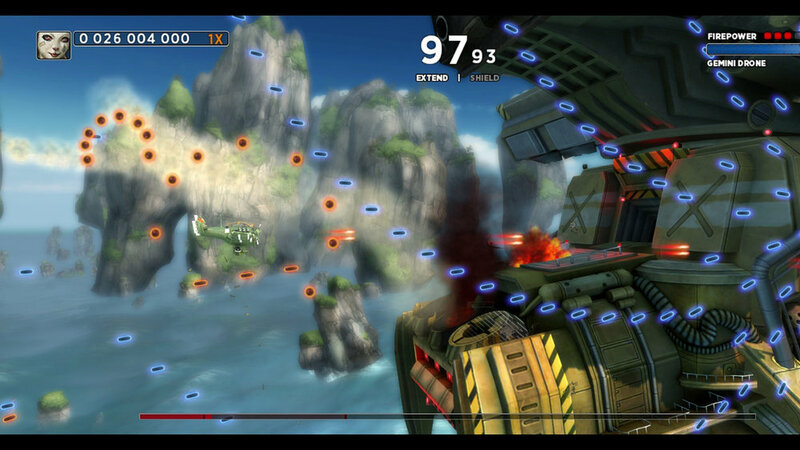 The game reminded me of shmups from the late 90s packed with action. Although the game is challenging, Sine Mora EX looks great and has a solid musical score. Sine Mora EX does not reinvent the shmup genre in any way but the game is still great. I recommend the game to new shmup fans and the experienced veterans. Best of all the game is around $10 on all platforms. Thanks to the publisher for letting us review it.